You know what's the best? Catching your husband softly singing lullabies to your baby. You know what's even better? That his lullabies were actually songs about Davie Crockett and Daniel Boone. And Everett was completely riveted. Oh, boys are so fantastic. It is so sweet to hear ou talking about your boys!! Awe!! :) That is sweet!! And man! You are up early! (well, 7:00am early) haha, is that weird i figured that out? I love this look! The red lippie, the red blouse and the red pants neutralized by the fur gilet. Genius! And about Ty singing to Ever, that's SO cute! Oh I just want a baby to cuddle! so very true! I absolutely agree. We have three boys and one of my favourite things is watching my husband play or hang out with them without any of them knowing I'm watching.....it's priceless. LOVE your pants! hehe too funny! My boyfriend was often lulled to sleep at night by David Bowie's "Starman." Whatever works, right? How sweet! Do you sing girly lullabies to Everett? Ahhh that is the sweetest! Boys ARE fantastic! And so is that top from Ruche! I'm loving the red on red with the hints of rust and brown in the boots and vest! I love your shoes!! lovely outfit~ Adore your shirt!!! love the red on red you are wearing here, and love the stories you tell of life with your husband and new baby, very touching and sweet! red is so your color! Oh cuuuuute! That must have been so adorable, they say there's no time when a man is more lovable than when he is with his children! ... ps. love the print and fur combo! I adore your outfit. The red looks amazing on you!! Welp, you are the cutest person ever. I too love my boys. I SO enjoy being a momma to a boy...and watching him with his daddy. Love that red polka dot top...do not see it on Ruche website...is it new?? I like the red on red! SUCH a cute outfit! I love it my dear. LOVE this fur vest! I feel like everyone has one except me :( I need to stop being so picky in my search and just buy one. Maybe after-Christmas sales will be kind to me. Awe :) That's the sweetest. Oh, it's decided. I want two boys. I love boys too! They are great! Great outfit! I never would have thought to put a red top on with red pants, but with the fur it looks great! I Love red with brown fur and brown boots! 2.) I caught my husband singing the song "If you just believe" last Christmas to our daughter. It was adorable. I love reading about your hubby and baby! It's so sweet the way you share your story and how passionate you both are about your bundle of joy! I can only hope one day my husband is just as cute with our future baby! So sweet, and I think your outfit is too cute! I need to score some red pants. Oh, that is just too sweet... My heart melts. That is absolutely the sweetest thing EVER! You are stunning dear! The Happiest of Holidays to you and your family! Super cute outfit you got on! Those pants are so nice! Love the red on red! That is too sweet! And your outfit is just gorgeous! 1. your outfit is adorable!!! 2. your boys are just so incredible! you're life is just so perfect girl! Thats so cute! My mum also always sang some little songs to me when I was a child ;-) ans i will so that too! LOve your Outfit! Could you look any more amazing after having a baby like what 7 weeks ago?! You are gorgeous woman!! You look gorgeous! Your top is super cute! You look beautiful, as always! You wear a fur vest like no other, and I am so inspired by your all red look! The desert boots complete this PERFECTLY! I love all of your little antecdotes (and instagrams!) about baby & hubby. :) Makes my heart warm! your outfit is seriously amazing. love it and love your blog! i want to melt in a puddle that's so cute. i just love boys. I love your shoes! any way you can link them? awwww that is soo cute!! can't wait for my hubby to be all sweeet with our boy!! That's such a sweet scenario! Forever 21 is my go-to for faux vests. I was wondering where your "wardrobe" site went? I always liked to look at your outfit photo postings on there!!! All so cute! I'm so pleased that your boys are so awesome, and these reds look lovely one you! I just fell in love with your blog! Who knew wearing head to toe red can look so glam! 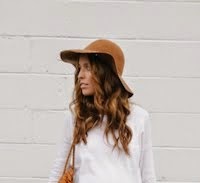 I love that you paired neutral accessories with the outfit to make it look so put together! You've got a new follower!